Shopping for a new Hyundai Kona? 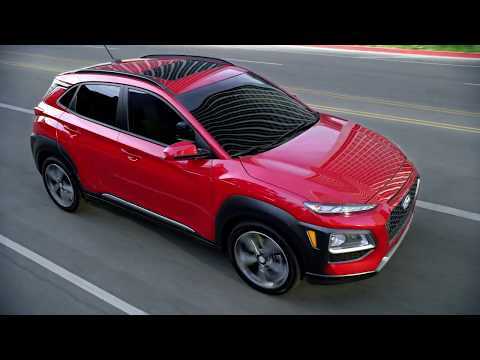 The Hyundai Kona SEL has all the tech and safety features we need, and skips the graunchy dual-clutch transmission. The 2019 Hyundai Kona plumps up its safety offerings, just as it prepares to launch a new battery-electric model. 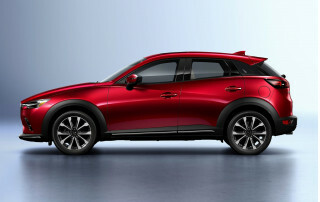 Both are important advances for a compact crossover that battles with the likes of the Subaru Crosstrek and Honda HR-V. The Kona’s kind of exhausting to look at. Adventures in styling? Suit us up, but there’s something not quite fully baked about the Kona’s sheet metal. It’s long on cladding and sculpting and surfaces, but a little shy on coherence. We like the cabin a lot, because it does its job without trying to showboat itself into the lead. The Kona’s base 2.0-liter inline-4 gets our nod, for now. 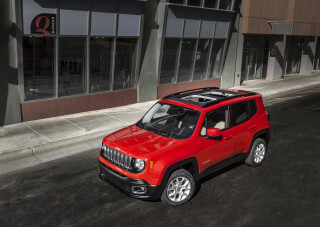 It’s smooth with its 6-speed automatic, with either front- or all-wheel drive. What it’s not: in any kind of hurry. Even the turbo-4 in Kona Limited and Ultimate crossovers is pressed for speed, but the turbo-4 comes with a dual-clutch transmission that needs some finishing school at city speeds. That said, we’d definitely spend extra for all-wheel drive, since the traction benefits also come with a better independent rear suspension that helps the Kona slip through esses with reasonable aplomb. Five people will fit, barely, inside the Kona. Four average-size adults will be happier with the Kona’s ride height and comfortable seats and leg room. Plus, their luggage will fit in the nearly 20 cubic feet of cargo space behind the back seats. Forget the Kona SE; it’s there for the low price of about $20,000, and though it comes with important features such as automatic emergency braking, it misses out on others. We’d opt for a Kona SEL with keyless ignition, 17-inch wheels, blind-spot monitors, Apple CarPlay and Android Auto compatibility, and a sunroof. The turbo-4 in the Kona Limited and Ultimate steers us back to the SEL; it’s tough to spend more than $25,000 on a Kona and make it better—unless you spend into the Kona Electric, which we cover separately. Experimental styles can reap major success, but the Hyundai Kona’s crossover experiment maybe needs a bit more tinkering. We’re fine with the interior’s neatly executed shapes, but the sheet metal’s taking its time to grow on us. Hyundai puts some keen ideas to paper—and metal and glass—at the front of the 2019 Kona. The headlights split into thin bands atop thick bands atop big air intakes. The grille vaults up to a thin cross vent from the ground. The cladding stretches from the bumper into the fenders. And that’s just at the front end. The sides bridle with all sorts of creases and lines, the roof can go color-contrast if you like, and the taillights wear gray-matte plastic surrounds inset among the body color. The Kona exaggerates every possible detail and that makes it busy in a fussy, awkward way, not in an exciting, new-direction way. We want to give it a glass of milk and have it calm down before bed, but it’s jonesing for Oreos and Pop Rocks. Maybe we should have thought more about having a young one at this age. Inside it’s considerably calmer. The Kona has a kitsch-skip function in its cabin, save for maybe the versions that line lime green around the vents and stitch the same color into the seats. It’s rational and orderly here, with oblong insets for audio and climate controls seated under a large touchscreen, next to a binnacle with big round gauges, all framed by big round air vents. Call us sticklers for convention, but what works, works. The 2019 Hyundai Kona teases with available turbo power, but the version we’ll probably like best comes this year with battery-electric power. The Kona’s base engine is a 2.0-liter inline-4 that churns out 147 hp, and couples to a smooth 6-speed automatic through either the front or all four wheels. The problem: the relatively well-tuned drivetrain carries around 3,200 pounds, and takes more than 10 seconds to get to 60 mph, though it’s geared to feel more fleet at city speeds. Hyundai’s turbocharged 1.6-liter inline-4 sounds like the cure, with its 175-hp rating. It’s hooked to a 7-speed dual-clutch transmission that’s not swift in connecting with the turbo’s boost, and that makes low-speed launches more of a chore. It’s also no more fuel-efficient than the naturally aspirated engine. If it were more fluid and fast, it’d be an easier sell. We’ll be eager to see how the battery-powered Kona EV fares, with its promise of excellent power and range. The Kona tackles the road through a MacPherson front strut suspension and a torsion-beam or multi-link rear, depending on whether it’s equipped with all-wheel drive. The torsion-beam front-drive models deliver decent handling through smaller tires, but the more savvy feel of the all-wheel-drive Kona with 17- or 18-inch wheels is better. With that setup, the Kona doesn’t have a trace of economy-car bounce, even with the biggest tires. 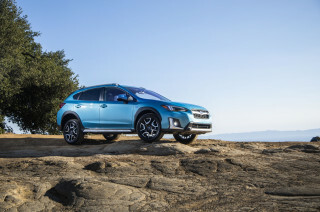 Coupled with the Kona’s 6.7 inches of ground clearance, all-wheel-drive models aren’t going to savage a Crosstrek in an off-road cage match, but AWD Konas will benefit from better traction on occasion and a gentler ride. Steering is confident and direct, and the Kona’s brakes have good bite. All told, the 2019 Kona behaves with hatchback good cheer when the road kinks, on par with its rivals. 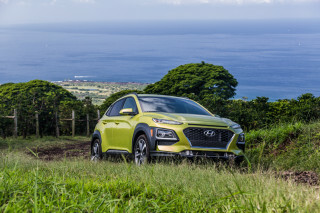 With the Kona, Hyundai wraps a compact crossover cabin with some higher-rent finishes that go beyond the usual cheap-and-cheerful feel. Konas have front seats with good adjustment range and supportive cushions. The high placement of the front seats makes it easy to climb aboard, and the base interior’s cloth feels fine. Leather comes on expensive Konas, and we think you’re better off paying less (more on that in a bit). The Kona’s interior doesn’t have as much of the gloss-black trim of its other cars, and the matte finish in the Kona will look and wear better in the long run, we think. The instruments and controls are blessedly foible-free, and wireless smartphone charging and twin USB ports live near each other in a front console with decent covered storage space. Save a space for smaller passengers in back. The Kona’s in a size class with the Subaru Crosstrek and Honda HR-V, and as such, the space for adults in back is lean. Outboard seats have good sculpting, but the hump seat in the middle won’t be comfortable for long, for anyone. Tall passengers will touch knees on the front seatbacks, but for others it’s fine. The Kona has 45.8 cubic feet of space behind the front seats, and 19.2 cubic feet behind the rear seats. The cargo bin has a low load floor and the hatchback opens wide for refills at the big-box store. Elsewhere inside the Kona, sound deadening and textured plastic relieve it of a thrifty feel, though the black interior gets confining. Gray upholstery looks better, but we’d skip the variants with hot green interior highlights. Even without NHTSA scores, the Kona gets a high rating. The IIHS calls it a Top Safety Pick+ when it’s equipped with optional LED headlights; all Konas already come with standard forward-collision warnings and automatic emergency braking. Keep in mind, less expensive Konas have worse headlights that don’t merit the IIHS award. All Konas come with active lane control, too, and blind-spot monitors are standard on SEL trims and higher. All-wheel drive is an option on any version, for $1,300. 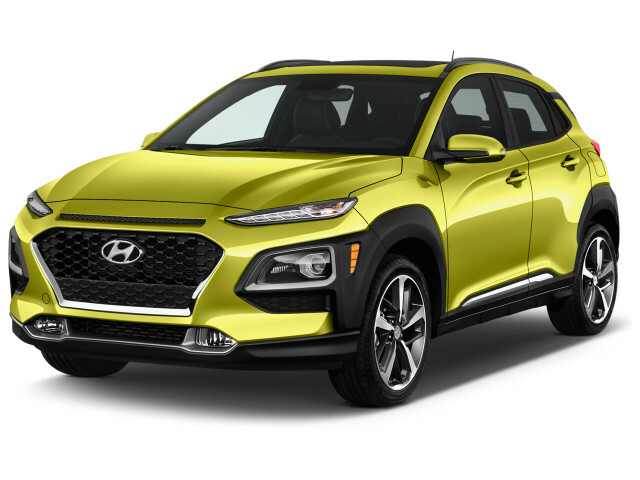 The 2019 Hyundai Kona is no skinflint. It’s generously equipped, has an excellent warranty and a good infotainment system. 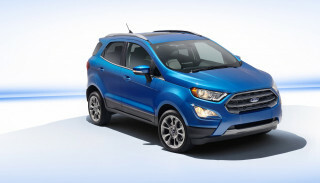 Even well-outfitted, more expensive trim levels present a very good value. The 2019 Kona comes in SEL, SEL, Limited, and Ultimate trims. 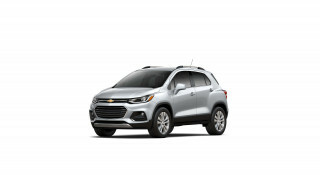 With differing powertrains (the turbo-4 comes on Limited and Ultimate models), the Kona can be configured with all-wheel drive on any trim, for $1,300. 5-year/60,000-mile bumper-to-bumper warranty that extends to 10 years/100,000 miles for the powertrain. A Kona SEL adds a few useful features, such as 17-inch wheels, keyless ignition, heated front seats, satellite radio, and blind-spot monitors, and that makes it our pick of the lineup. Power front seats and a sunroof are options, as is Infinity audio. Kona Limiteds can’t be equipped with a sunroof, an odd omission, but they get the turbo-4, 18-inch wheels, leather upholstery, LED taillights, and a power driver seat. Ultimate Konas add to that the sunroof, an 8.0-inch touchscreen, a head-up display, wireless smartphone charging, and navigation. All-in, the Kona Ultimate’s price of about $30,000 stretches the idea of a bargain crossover to its size limits. Hyundai sells a gas-powered Kona crossover, and its EPA ratings come in soli—but the coming electric Kona will be the best bet. Most shoppers will end up with a Kona SEL with front-wheel drive. It’s rated by the EPA at 27 mpg city, 33 highway, 30 combined, enough to earn our 6. Add all-wheel drive, and the ratings drop to 25/30/27 mpg—and add $1,300 to the sticker price. Save two ways, if you can, but we prefer the AWD version’s ride. On Limited and Unlimited 2019 Konas, Hyundai fits a 1.6-liter turbo-4. The EPA says it’s good for 28/32/30 mpg when configured with front-wheel drive, and 26/29/27 mpg when the rear wheels also draw power. All the Kona’s chief rivals—Crosstrek and HR-V included—earn EPA combined ratings of about 30 mpg. The Kona EV, meanwhile, gets an EPA-rated 258 miles on a full battery charge. If you’re inclined to get power from the grid, it’s worth a look. Looking for a different year of the Hyundai Kona?